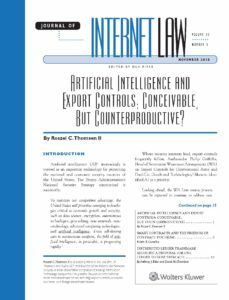 Roszel Thomsen has published a timely article, “Artificial Intelligence and Export Controls: Conceivable, But Counterproductive?”, in the November 2018 issue of the Journal of Internet Law. 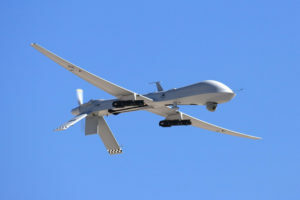 He discusses recent AI developments and spotlights the surprising challenge of bringing export controls to this field. August 15, 2018 — The Best Lawyers in America© once again recognizes Roszel Thomsen for his work in Information Technology Law. He has been listed continuously since 2006 by peer review. He is included in the 25th edition (2019). 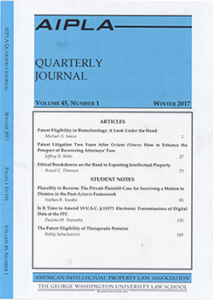 JUNE 6, 2017 — The American Intellectual Property Law Association Quarterly Journal has published an article by Roszel Thomsen, “Ethical Breakdowns on the Road to Exporting Intellectual Property”, in its Winter 2017 issue. 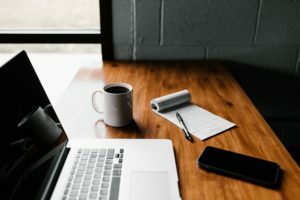 Using an engaging hypothetical situation, the article provides an overview of deemed export and ethical issues as an attorney contemplates hiring a foreign national to assist in patent work. November 1, 2016 – U.S. News and Best Lawyers today released the 2017 “Best Law Firms” list. Thomsen and Burke LLP has earned Tier 1 recognition as a Best Law Firm in the Information Technology Law field. U.S. News and Best Lawyers carry out a rigorous evaluation process to rank more than 11,000 U.S. firms, using client and lawyer evaluations and peer review. A Best Law Firm must also include an attorney currently selected as a Best Lawyer in that practice area (Roszel Thomsen). Congratulations to Roszel C. Thomsen II of Thomsen and Burke LLP on having been selected by his peers for inclusion in the 23rd Edition of The Best Lawyers in America®. Roz was recognized for his work in Information Technology Law. He has been listed continuously since 2006. Questions? Contact us at info@bestlawyers.com. In the Journal of Internet Law‘s September 2015 edition, Roz writes about the unintended consequences of the Commerce Department’s implementation of changes agreed to at the Wassenaar Arrangement. This is Roz’s 11th year being listed in The Best Lawyers in America. Roz will serve a four-year term on the Information Systems Technical Advisory Committee (ISTAC).